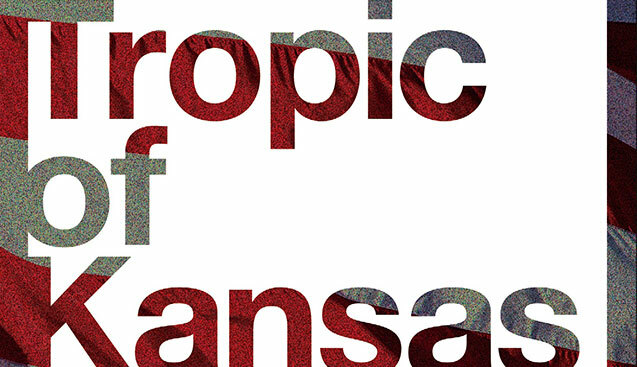 Christ Brown's debut novel, Tropic of Kansas, will be out in July -- but Brown finished it years ago, long before the darkly comic trumpian political intrigue it envisions became more like factual reporting than satire. Barnes and Noble have just published a long excerpt from the book for your delectation -- I have a review of it scheduled for July 11. Eagle One flew in fast from the west, then yawed back over the East Lawn, engines whining overthrottle, blasting air onto the ground. Eagle One was the flagship of a new line of Anglo-American tactical aircraft the President had promoted as superior to the helicopter. It could fly faster and higher, with even better vertical takeoff and landing capabilities. All jet, no wings—just stabilizers at the tail. Manufactured by a company he still had stock in. Tania tried to see through the cockpit window, to see if he really was the pilot, but the glass was as opaque as the midnight blue fuselage. It was a beautiful and scary thing, with its Luftwaffe ’46 lines guided by 21st century electrorobotics. Visitor from a different tomorrow. She’d seen it on the big screens for the last inaugural, when it flew in from Camp David, but seeing it in person was a whole different deal. Pure wonder. Like some cross between a royal yacht, an experimental supercar, and a unicorn. “Dark Apollo has landed,” joked Odile, barely audible through the noise.